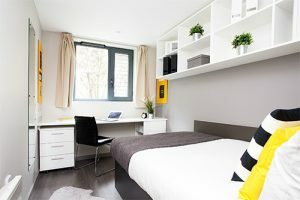 The University of Sheffield International College is proud to present the new St Vincent’s Place accommodation which is scheduled to open in Mid-August. It is fully managed by the University of Sheffield. St Vincent’s Place, located just 2 mins away from the International College building, is a great fit for international students studying in Sheffield. This striking new development markedly includes a beautifully renovated Roman Catholic church which is a social space for students with a range of communal facilities. 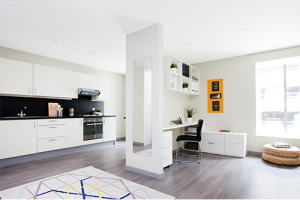 St Vincent’s Place offers over 500 fully-furnished and high quality student apartments and studios, not to mention free wifi access. All students under the age of 18 are guaranteed an accommodation in St Vincent’s Place. USIC offers a 44-week contract (8 Sept 2018 – 13 July 2019) to students who have accepted the offer. The tenancy period aligns very closely with term dates including re-sit period. In addition, USIC allows the extension of tenancy if necessary. Full tenancy at St Vincent’s Place is fixed at approximately £6,456. Any reservation of room made will require a £150 deposit. (Student can claim a refund if they choose not to take up tenancy) All tenants will receive a #BigSheffieldWelcome pack, which includes bedding & kitchen utensils, upon checking in. The rental of cluster flats in St Vincent’s Place at an estimated fee of £147 per week is another option. Rent includes all utility bills, basic insurance, high speed Wi-Fi, Residence Life activities and events. Additionally, there are studios available at £187.50 per week. Once you have confirmed your offer to study at the college, a link will be send to you for registering an account on the University’s accommodation booking portal which can be used to manage payments, select and reserve your room. Choose your accommodation and complete your application. Make any remaining accommodation payments directly to the University. 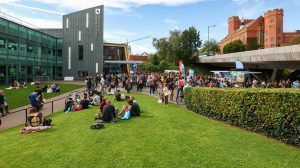 The University provides round the clock on-site security so students can focus on their studies and Residence Life Mentors who are Sheffield seniors living in the accommodation to help students adjust to life in the campus. For more information on Sheffield’s latest accommodation, please do drop us an email at info@gstudyabroad.com or fill in the enquiry form below. We also welcome walk-in consultations. Global Study Abroad provides free consultation services and offer scholarships and bursaries.